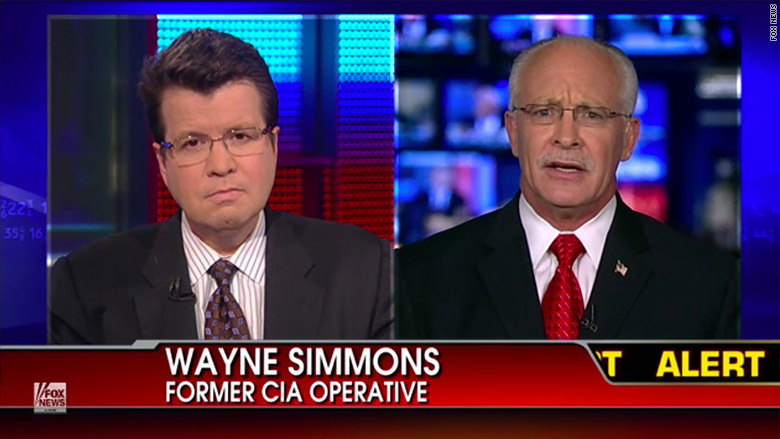 Wayne Shelby Simmons, a recurring guest on Fox News who prosecutors say falsely claimed to have had 27 years of experience in the CIA, pleaded guilty to fraud against the government on Friday. Simmons admitted to making false statements about his financial and criminal history. He also acknowledged that there were no records or evidence that he was ever employed by the CIA. "Wayne Simmons is a convicted felon with no military or intelligence experience," Dana J. Boente, a U.S. Attorney for the Eastern District of Virginia, said in a statement. He had previously been convicted of federal firearms charges, court documents state. Simmons also pleaded guilty to defrauding an individual out of $125,000 through a wire charge related to a bogus real estate investment. In addition, he pleaded guilty to unlawful possession of two firearms, which the Justice Department said "he was prohibited from possessing on account of his prior felony convictions." When Simmons is sentenced on July 15 he faces possible maximums of 10 to 20 years on the various charges. On Fox, Simmons was often referred to as a former CIA "operative," "analyst" or "officer," the same terms he used to describe himself on his own website. A Fox News spokesperson told CNNMoney that Simmons "was never a commentator or contributor," because he was not paid by the network. She said the network therefore saw no need to comment. Nevertheless, the Simmons affair has been a warning to television networks that rely on the input of outside analysts whose claims to expertise are often the result of their own self-promotion and past media appearances. In his appearances on Fox, Simmons regularly made extreme and factually dubious statements pertaining to terrorism and national security. Last year, he claimed there were "at least 19 paramilitary Muslim training facilities in the United States." Simmons also claimed that waterboarding was not torture and accused President Obama of being a novice who lacked spine. But in Simmons' case, this went far beyond punditry: By earning an assignment as a defense contractor, he was put in a position where he advised military personnel. "Simmons admitted he attempted to con his way into a position where he would have been called on to give real intelligence advice in a war zone," Dana J. Boente, a U.S. Attorney for the Eastern District of Virginia, said in a statement. "His fraud cost the government money, could have put American lives at risk, and was an insult to the real men and women of the intelligence community who provide tireless service to this country. This case is a prime example of this office's ongoing commitment to vigorously prosecute government fraud and threats to national security." Editor's Note: The headline of this story has been changed to more accurately reflect the admission of Wayne Simmons. Though Simmons acknowledged that there was no record of his employment at the CIA, he did not admit that he lied about working for the agency.